Lazar Džamić, creative strategist of international renown, until recently head of Google’s ZOO team for brand strategy, opened the second segment of the programme, called Find Me Easy. 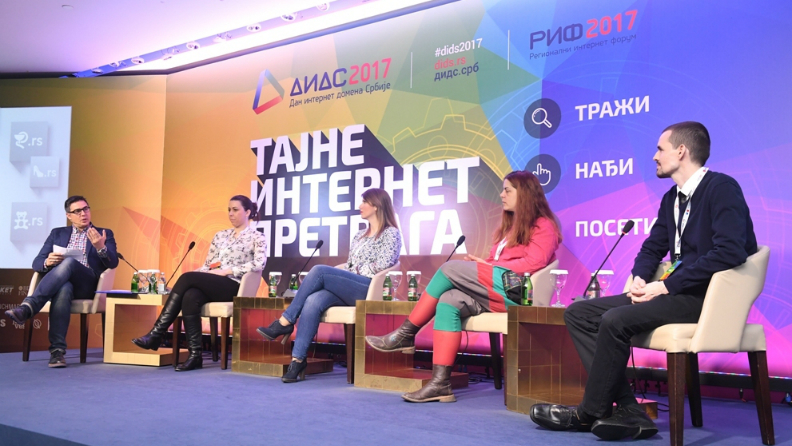 Džamić tried to give an answer to the question of how content creation and search optimisation on the Internet can work to benefit one another more successfully in a time when, as he put it, it is easy to be ignored. “All modern marketing is mass-orientated, direct and digitally mediated. This is a change to the earlier paradigm we had all become accustomed to; after this, only those who have adapted quickly will survive, because the world has become a brutal place. Money follows interest. But this interest must be earned in order to be successfully monetised at some point. However many companies with a web presence – including even some of the biggest players – often take the wrong approach, and opt to create large volumes of content instead of focusing on quality. 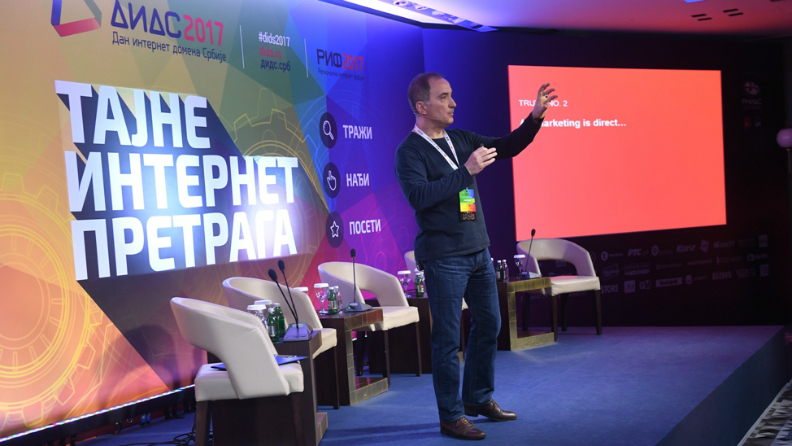 The fact is that well-crafted content offers far more opportunity for successful optimisation,” Džamić explained. This is especially true when you consider the fact that as much as 54% of the average digital media advertising budget is squandered because it is not used in an effective way. However for quality content to create the desired impact, it is of vital importance to ensure it is targeted towards the right group. He observed that an advertising message, apart from being appropriate, also had to be as authentic as possible – that was very important: “The customer sometimes needs to be ‘taught’ what to Google. If everyone is advertising the same thing then you need to come up with a new catchphrase for them to Google.” Only then can you move onto studying the algorithm itself, i.e. technical tweaking,” said Varga. During the third part of the programme the audience had a chance to see some “Good examples of Internet presence” from the Serbian scene, through the stories of successful home-grown entrepreneurs who saw and took their opportunity to draw in new users through a modern and original Internet presence. Sharing their experiences were representatives of superskola.rs, gradnja.rs, lespetits.rs, mojazubarka.rs, alibris.rs, the company Benchmark and the Belgrade Philharmonia. “It was the quest to get early tickets for Philharmonia performances that got our oldest subscribers using the Internet. In establishing communication with them online, our decision to be present both on the Latin-script .RS and the Cyrillic-script .СРБ domains absolutely proved to be the right choice. It reflected our desire to be authentic and to cultivate our linguistic tradition,” said Bojan Stanković, social networks coordinator for the Belgrade Philharmonia. The upcoming generations also have good reason to become part of an online community – the site superskola.rs (SuperSchool) is committed to providing pupils of the upper grades of primary school with informal assistance in their education, through more than 80 different online tests, 1,500 exercises with step-by-step explanations and no less than 700 video lessons. 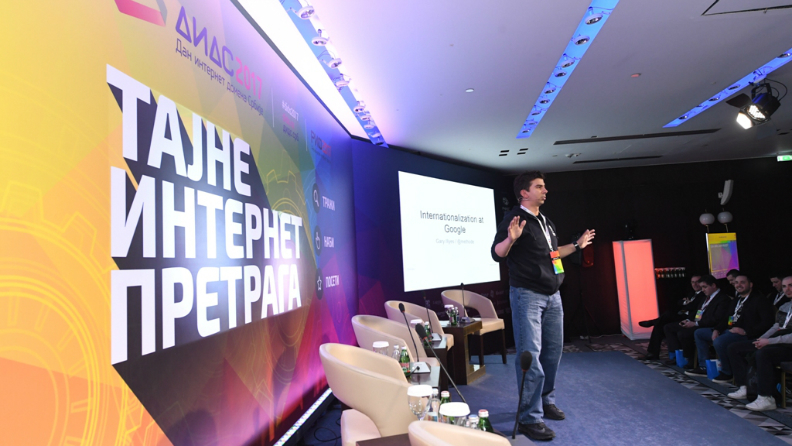 “Children are more at home in the digital environment than adults, and get to grips with online tools more quickly and easily,” said Nenad Radoičić from SuperSchool. This is another way in which RNIDS promotes small business-owners from Serbia who are successful in their businesses but also successful in terms of their online presence – those who have capitalised on the fact that websites targeting the local, Serbian market are given priority by the search engines when they are on the national .RS and .СРБ domains. Some of these experiences are already accessible in the form of video testimonials and mini-interviews on the website naravno.rs. Video recordings of the entire DIDS 2017 event will be made available at dids.rs.